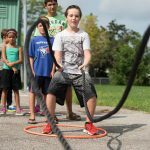 2 Why You Need Battle Ropes For Fitness? The “Best Battle Ropes For Home Gym” offers a killer cardio workout. They’re like must-have pieces of equipment for anyone trying to pack the lean mass. The Battle Rope exercise work on each arm independently. This amazing gym equipment eliminates strength imbalances as they form your muscle on your arms,” says John Brookfield, inventor of the original battle-ropes system. Basically, battle ropes are recommended for those who want to improve their body and increase strength by combining a set of exercises with hand swinging. Even if it’s the first time when you hear about this amazing exercise item, rest assured that people worldwide have been using it and have seen incredible results in their daily routine. 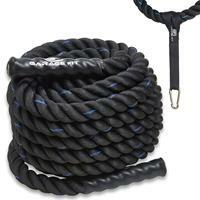 We created a list of the best size battle ropes for you to choose the one you need. Basically, you must use a thick rope for this type of exercises, since regular ropes are not strong enough. 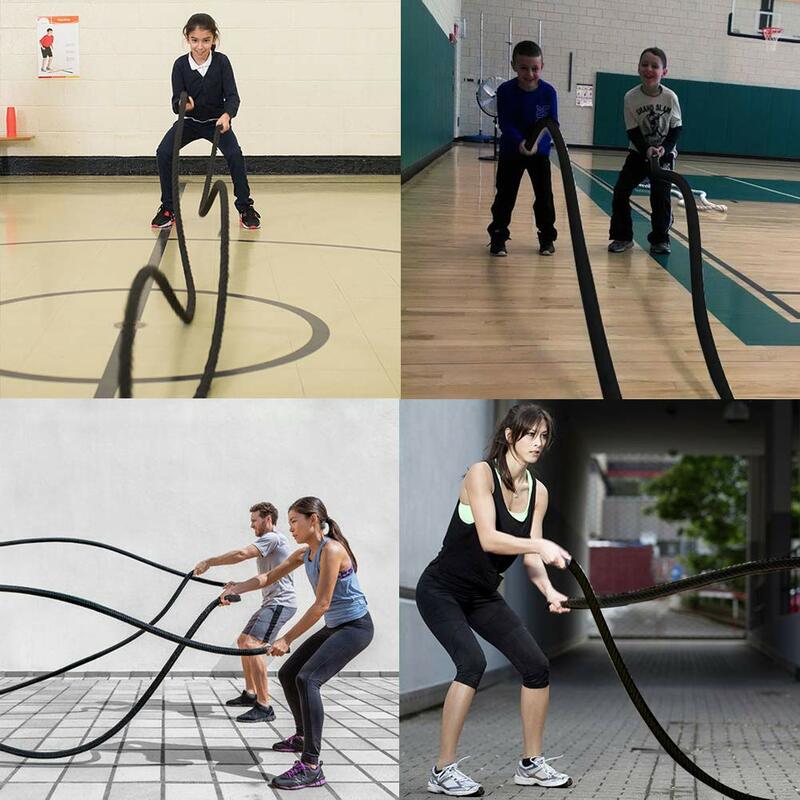 In addition, battle ropes are specially designed to last longer and to be strong for any type of exercises, while regular ropes may break or injure yourself. NEXPro is among the best battle rope manufacturers. This Polydac undulation rope will give your fitness training new feelings since you will improve your full body in a shorter time. It is built from 100% polypropylene and polyester, making it very strong and resistant. In addition, it has a 3-strand construction with strong twisted ropes with heat shrunk caps at the ends. Furthermore, the 600D Oxford Waterproof sleeve helps in protecting it against friction so that you can enjoy it for a long time without damaging. Its size is of 1.5” width and comes in three lengths: 30, 40 and 50 feet. Also, its weight depends on the length, coming in 18 lbs for the 30 ft rope, 23 lbs for the 40 ft rope and 27 lbs for the longest 50 ft. The best part is that there are no restrictions regarding height or weight, anyone can use this battle rope and choose the best size battle rope they need. Even though they are made in China, they will guarantee strength and great work out exercising, building your entire body. You can exercise with this Poly Dacron battle rope anytime, anywhere and for as long as you want to. All fitness levels are suitable for this heavy rope since it comes in 30ft and 50ft lengths, chosen according to your needs. Plus, the great grip handles to protect your hands from injuries due to the heat shrink caps located at both ends. These also protect it from unraveling, giving long-term protection and resistance. What is more, This “best battle ropes 2019” are easy to store anywhere due to the roll-up option. They are flexible and easy to carry anywhere, giving you access to exercise at home, in nature or in the park. In addition, this best battle rope is not very light, which is why their weight is perfect when working on your arms strength. It is enough to use it for 10 minutes to feel how your entire body is working, building up all of your body muscles. Available in 2 width sizes, the Zeny Black Battle Rope comes in three different lengths for you to choose the best size battle rope for your exercises. Its resistance is guaranteed by the 100% Poly Dacron, built from a 3-strand twisted rope for a stronger and durable construction. Plus, its heads are apprized with heat shrink caps, to avoid damage on the long run. The thin orange or yellow lines give a unique and professional look to the rope, reminding you of the strong hiking equipment. It is also convenient for maintenance, while the 600D Oxford Sleeve protects it from humidity, fray, dust, and friction, for longer protection. 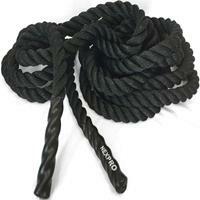 Anyone can use the Zeny Black battle rope since it comes in three sizes depending on the experience level. For example, if you are a junior you can opt for the 30ft rope, regardless of the width, while if you are an intermediate you can go with the 50ft one. Beginners can also use the 40ft rope, while experts need longer ropes for more exercising difficulty. 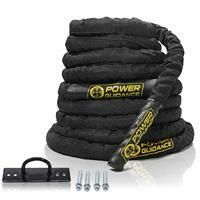 The Power Guidance battle rope gives awesome muscle toning and metabolic workout options for your fitness exercises. 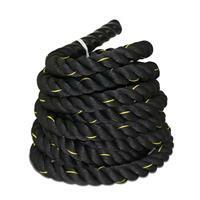 This 1.5” width battle rope comes with an anchor included to ensure that your exercises are well done. Also, it is available in three lengths for each user level, making it perfect for anyone. With heat shrink handles and 3-strand twisted rope design, this ‘best battle ropes 2019′ is constructed of 100% Dacron, making it durable and stronger than polydac materials. Plus, you can use the 10 inches handles for better grip and hands protection. Combine this battle rope with your regular exercises and you will experience full body workout as never before. Users of any level can use it: the 30ft length is perfect for beginners, while the 40ft version suits intermediates and 50ft are for advanced users. You can increase your efficiency by upgrading to a longer version since the longer the rope is the harder it is to use. 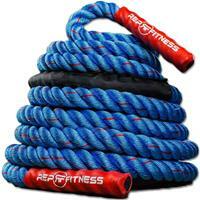 The amazing Black and Blue battle rope Rep V2 is another perfect choice for strong exercising. It is constructed from 100% Poly Dacron to allow maximum resistance and flexibility to any user. It comes with a protecting nylon sleeve to keep it away from friction, while its heat shrink ends to protect it from damage and can be used as a good grip while working out. Even though it is not recommended to use on rough surfaces such as concrete or asphalt, this soft battle rope will show powerful wave actions. Its width of 1.5” is perfect for fitness, while the 2” give a stronger workout. The longer the rope the harder it is to use, increasing the exercise difficulty due to its weight increase. Why You Need Battle Ropes For Fitness? Imagine that you want to follow a full workout for all of your muscles in a short time, during a break from work or until your friends come over. Did you ever think about combining the elements with a battle rope? It is very easy and it gives you full body workout during a short period of time. When searching for online videos of battle ropes workout, you will notice that they are very easy to use in ways that you never thought of. You can even play with your imagination and use them almost anywhere, from your own personal home gym to your garden or even when visiting the surrounding sights. You can apply it to a tree and pull yourself when doing sit-ups, you can attach it to a tree branch and use it to do pull-ups and you can even use it as a swing to improve your arms stability and strength. The Battling Rope Crossover is an exercise that slams the battle rope to the floor. Brookfield said that best battle rope exercises create more power and hammers in your core. Directions: Keep both feet flat on the ground and lift them to your left and then slam them down hard to your right. Do it again in the opposite direction. Keep on alternating for 1 to 20 minutes. This is the typical and best battle rope exercises. Brookfield said that this rope exercise works on each arm separately and keeps your muscles under pressure for extended periods. Directions: At first hold the ends of the battle rope in front of your hips. And after that brace your core and begin alternately raising and lowering each arm explosively. Keep alternating arms for 1 to 20 minutes. Overall, these five best size battle ropes for home gym will give you more options when working out. You can use them while doing your regular exercises or you can create your own workout routine, based on online tutorials and training videos. If you also want to experience more you can use your creativity and play with these ropes anywhere. Overall, battle ropes for the home gym are easy to store anywhere, while exercising with them will give you more strength and body build. These thick ropes are strong and flexible, constructed either from poly Dacron or pure Dacron, which make them the best choice when experiencing the best workout sessions.